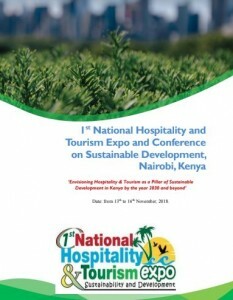 1st National Hospitality and Tourism Expo and Conference on Sustainable Development, Nairobi, Kenya. Tourism, frequently referred to as ‘the world’s fastest growing industry’, is big business. By the end of the 20th Century, international tourism alone was generating over US$ 450 billion annually. Total global tourism activity ( both international and domestic) is been estimated to be worth some US$ 3.5 trillion. Moreover, it is anticipated that these figures will continue to increase for the foreseeable future. Tourism is expected to grow at an annual rate of about 4% in international tourist arrivals while spending by 2020 is expected to generate up to US$ 2 trillion a year. The World Tourism Organization (WTO) predicts that by the year 2020, international tourist arrivals will hit the 1.6 billion mark. In Kenya, Hospitality and tourism industry is one of the most important socio-economic sectors and a leading component in international trade. The sector contributes 10% to the Gross Domestic Product (GDP) and employs 11% of total workforce. The industry has experienced tremendous growth in the last decade (6.7%), with an increase in the number of international hotel chains and family investments, all of which have increased supply of the bed capacity. International arrivals increased to 1.4 million in 2017 from 1.3 million in 2016. Kenya has a very diverse product (natural and cultural heritage) spread out in 47 counties. Since devolution has attracted major development agenda in these counties, many of them are struggling to find a footing on product development, marketing, and infrastructure development such as hospitality establishment in the regions. This development can only be achieved if approached through planning backed by knowledge obtained through research data shared in conferences and expos. Kenyatta University, School of Hospitality & Tourism which is a premier contributor to the industry through training and research will host the 1st hospitality and tourism national expo and conference on sustainable development. The main theme is to envision Hospitality & Tourism as a Pillar of Sustainable Development for the year 2030 and beyond. The Expo and Conference intends to feature all counties in Kenya and brings on board the industry and academia to have a national dialogue on tourism sustainability especially with the current devolution of tourism governance. It aims at bringing together professionals in the industry as well as many stakeholders for the purpose of experiencing and sharing knowledge. This is a great opportunity for counties with unexploited tourism potential, to learn, network and promote their attractions and hospitality facilities.